The accommodation is of an impressive 4 star standard. On arrival a basket welcomes you with tea, sugar, biscuits, chocolates, juice, a well as tea towels, washing up liquid and bin bags. You will be greeted with a smile and shown to your accommodation. You can enjoy a swim in our private heated indoor swimming pool which you will have exclusive use of for an hour per day. Your pets are more than welcome at Kingfisher Barn, and there are plenty of walks nearby. Situated on the Thames path in a peaceful location we are surrounded by fields, yet with the Town Centre, shops, pubs and restaurants being only 5 - 10 minutes walk away. Local attractions such as Blenheim Palace, Oxford city centre, Milton Keynes Shopping centre and the Cotswolds are only a short drive away. We are conveniently situated with good access to bus and train stations, the A34, M4 and M40. Kingfisher Barn is ideal for everybody to enjoy, with some special features for disabled guests including disabled bars in bathrooms, grab rails, and overhead tracking in bedrooms and bathrooms for hoist systems. Cots, highchairs, cotsides, slings and hoists are available, free of charge, upon request. 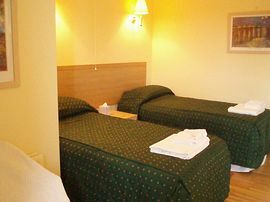 All accommodation is fully furnished and equipped with central heating throughout. There is also a private garden area with garden furniture. All accommodation has a TV with video, washing/drying machine, microwave, fridge freezer and of course a cooker! Childrens welcome baskets are available on request and include: videos, games, colouring books and pens. We guarantee you very high standards throughout your stay. Our aim is to make your stay as pleasurable and easy as possible. 4 out of our 6 cottages offered disabled access. We have wider doors, grab rails, transfers from the toilet to bath/shower. Most bedrooms and bathrooms are on the ground floor. 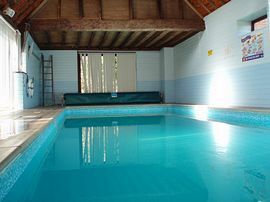 Our heated indoor swimming pool has a hoist in the changing room and a dipper into the swimming pool. Hoists, slings, cot-sides, shower chairs and commodes are available to hire, free of charge. On arrival your beds will be made and towels will be provided (1 large, 1 small per guest) The linen is changed on a weekly basis. We recommend that you bring another towel if you will be swimming. Pets are welcome and are charged at £40 per pet, per week and £20 per pet, per part week. There is a maximum of 2 pets per cottage. We provide a water bowl and treats for the pets on arrival. The cost is also for the extra cleaning when you have departed. Smoking is allowed outside of the cottages. We have a wendy house for children to play in and lots of gardens. You are welcome to bring your own outdoor games. An indoor swimming pool is also available. Local Services: Services include: dentists, doctors, vets, hospitals. Shops nearby are the local butchers, bakery, chemists, card shops, newsagents, clothes shops, music and art shops. There are lots of cafes, pubs and restaurants. Proceed to the A34 to the A415 Abingdon exit. From A34 head for the Town Centre across three roundabouts. After third roundabout you will find yourself on Ock Street (A415). Proceed to the traffic lights. Move into the left hand land, pass two pedestrian crossings and the chuch clock tower on the left. Continue straight, pass the Nags Head Pub on the left when crossing the bridge over the River Thames. Just over the bridge, turn left into the public car park and follow the lane in front of you. This will lead to Kingfisher Barn. Granary Cottage: (sleeps 2 - 4) £348.00 - £430.00 per week / £296.00 - 367.00 per part week. The Nest: (sleeps 2-4) £393.00 - £471.00 per week / £336.00 - £400.00 per part week. Hazel Cottage: (sleeps 4) £472.00 - £606.00 per week / £401.00 - £495.00 per part week. 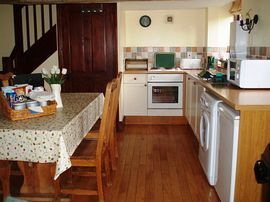 Stable Cottage: (sleeps 6) £630.00 - £729.00 per week / £534.00 - £620.00 per part week. 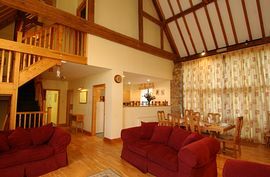 Kyte and Kestrel Lodges: (sleeps 8-10 in each lodge) £1107.00 - £1531.00 per week / £941.00 - £1531.00 per part week. Monday - Friday 7.00am - 7.00pm. Saturdays - 8.00am - 2.00pm. Sundays - 8.00am - 12.00noon. Guests can arrive after these times. We have members of staff on site who will show you to your accommodation. "The accommodation provided was excellent and the welcome basket on arrival is a lovely feature. I have no doubt that we will be returning" "Thankyou for helping to make our stay a happy and comfortable one, I felt our residents benefitted greatly from their holiday." "It was not just the fact that it was comfortable and exceptionally clean but it was also very peaceful, and convenient for everywhere." "On our last visit to Abingdon we chose to stay at Kingfisher Barn again. With delightful staff and accommodation, tranquil location and superb facilities, The Nest is perfect to relieve stress! A home from home feeling and we will return again, as always. The staff are very friendly and more than helpful, every attention to detail is there and the lodges are truly spacoius and clean. 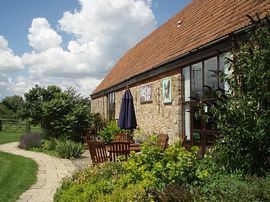 We would recommend Kingfisher Barn to anybody looking for a self catering holiday in a lovely settting". We were recognised as an Investor in People in January 2006.